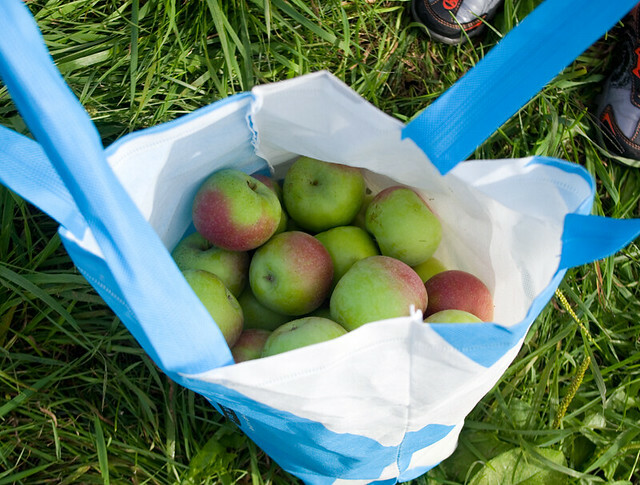 One of the things that we do as a family is go to a local orchard in the late summer or fall to go apple picking. We used to go every year, but since we moved into our current abode we’ve only gone every second year because our own apple tree in the back yard fruits in alternate years. That trend may not continue because our poor tree is quite sick, much to my chagrin, and may have to be cut down next year. It has been losing leaves progressively through the tree all summer, leaving it almost half barren at the moment. If it comes back even a little next spring, we’ll see what we can do to save it. 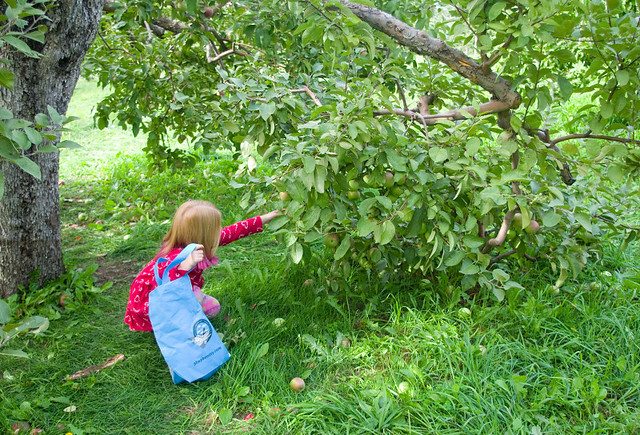 At any rate, it wouldn’t have been an at-home apple harvest this year anyway, so we went to the orchard. The orchard that we visit specializes in McIntosh apples, which is the most traditional Canadian apple, and Lobos, which are a McIntosh offspring. These apples are good both for eating raw and for cooking. This means that the kids will be packing the smaller ones in their lunches for weeks, while I’ll be turning the larger ones into butter, pies, crumble, and possibly even caramel apple egg rolls. The day dawned clear and cool, which is perfect for apple picking. The kids did their best work under the low-hanging branches, some of which were so laden that they permanently touch the ground in spots, or are propped up on stakes. Thing 1 and Thing 2 had special help from Dad to reach some of the taller branches, although most of the trees were too tall to reach the very top. Between the four of us we ended up with almost forty pounds of apples in about fifteen minutes! 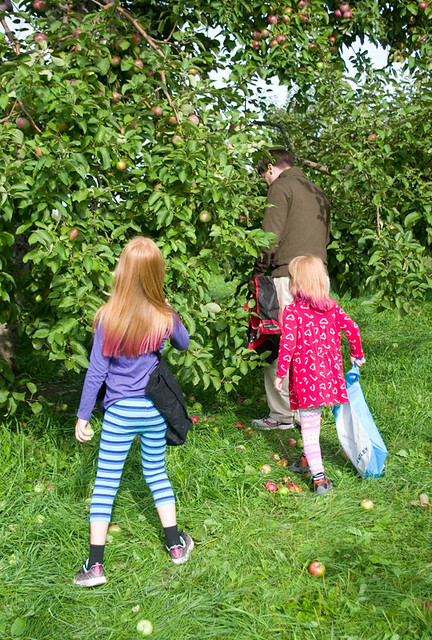 You can’t beat apple picking for speed, in comparison to, say, berry picking, which seems to take forever even with plants that are chock-full of fruit. The rest of the kids’ time was spent climbing over defunct tractors, running through the barn, and playing in the park. 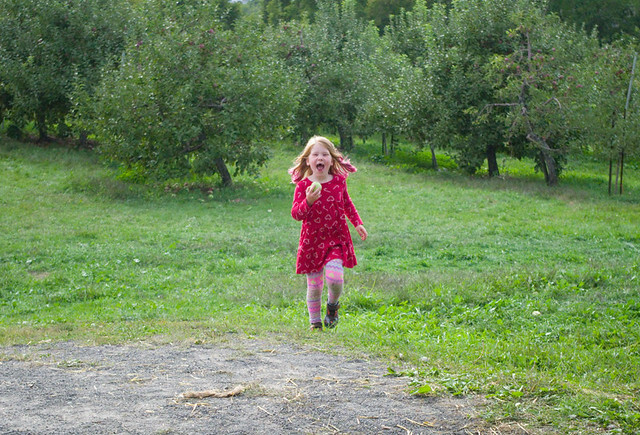 This is my favourite picture of the day: Thing 2 running back to us after an employee told her she could pick an apple to eat straight off the tree, no charge. If only we could all still have so much joy in a single apple!